Countering sentiments recently expressed on this blog (and by many Insiders), market research firm DisplaySearch has doubled its forecast for 3D TV sales in 2010. The firm’s previous prediction of 1.2 million sets sold this year has been revised upward to 2.5 million, with a forecast of 27 million units sold in 2013. Is the firm right to be so optimistic in its forecasts, Insiders? 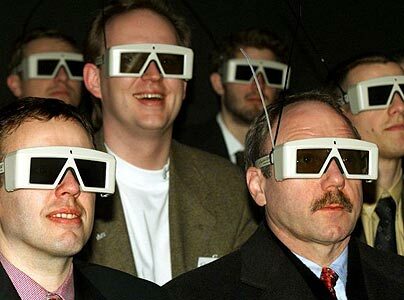 What are the chances of 3D TV really taking off this year? Could you find a place in your living room (and your wallet) for a 3D setup? These people must be on something. With all the people who JUST transitioned over to HDTV, it will be YEARS before anyone thinks about “upgrading” to such a new unproven expensive technology. It’s not that you just have to buy a new more expensive TV, also a new blu-ray player and glasses. Not to mention all the complaints of headaches and everything else that comes along with 3D movies in the theater. They may find a small niche with gamers and early adopters and videophiles, but that’s it. No thanks. I don’t plan on even buying HD television. I’m an electronics salesperson, and in general, most customers who come into our store are curious to see the 3D sets, but have no plans to purchase in the near future… especially when they learn that (in most cases) the glasses must be purchased separately and they can’t just use the pair they got when they went to the theater to see Avatar.